8 companies are looking for non-government funding of their innovative fusion ideas. Hoax or real? There are a number of reports in the recent months of Amazing! New! and Simple! ways of generating fusion power. Fraction of the cost of mainline fusion designs! Power cheaper than coal! Whoosh! What could be better than those? Just try our one simple trick and get all the free energy you want! Oh? Sounds like a phishing ad – maybe like those in the side boxes at Yahoo News. Or maybe … could they have the real thing, that simple step? You know – the one that works! This post is the lead-in to our new series called Fusion Paths Not Taken about the wanna-be game-changers operating in the fusion energy arena. Or, at least, those that are making a fuss in the news media. 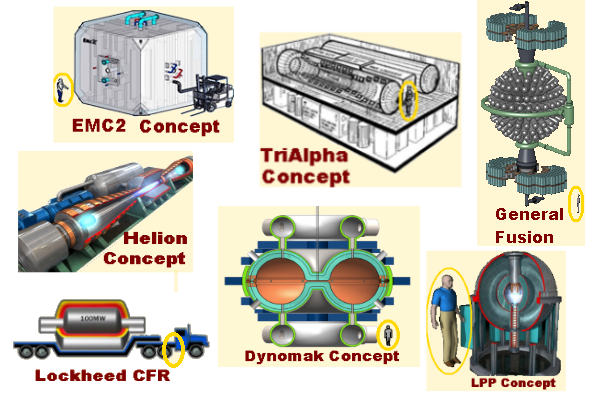 FIg 1 shows 7 of (at least) 8 hot fusion aspirants who are generating breathless reports on new ways guaranteed to make fusion power. And Hey! they each need private funding. These show scaling to human size (the Helion concept is only described in literature as “truckbed” size. One of our contestants has not released conceptual reactor pictures, though they are in pursuit of funding. In posts to follow, we will discuss these efforts that are outside the main line path. 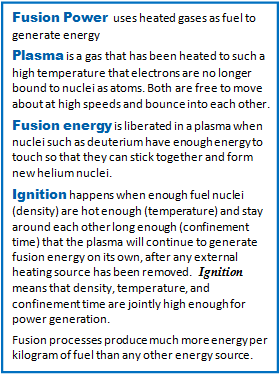 Each has its chosen fuel listed, details in our analysis of fusion fuels. program at the University of Washington graduate school (Redmond Washington is a hot-bed of fusion ideas and entrepreneurship). All of these designs use ideas that have been around for decades. Most are based on tests of low temperature plasmas and most have clever modifications that sound reasonable. Independent of the analysis that we present later, there a few over view thoughts that anyone with extra cash ought to consider prior to investment. Stellerator, Astron, Ignitor, TFTR (Tokamak Fusion Test Reactor), NIF (National Ignition Facility), Perhapsatron … Over the past 60 years, these were the enthusiastic names given to plasma test machines as they were being planned around the world. Heck! This idea is so cool, it obviously will generate fusion power! Reactor –a generator of extractable power which can be stored for later use. It does not have to be more out than was put in, just obtainable. But, fusion reactor pronouncements have been common. Fig 2 is an advertisement in the Scientific American magazine of October, 1958. This is the issue with Lyman Spitzer’s first popular science article on his stellerator device. Notice the size of the technicians far in the back. 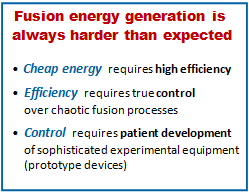 Now go back and look at Fig 1 using this ad as your measuring standard for all fusion claims. These are not fakery, not output from Confidence Racket schemes. They are the optimistic projections of dreamers. “On Line by ’79!” KMS Fusion scientists rallied about this slogan in the early 1970s as they built the then most powerful laser in the world (Chroma), their battle cry after 1974 when they produced the most neutrons from any laser lab, anywhere. They absolutely knew that their optical hohlraum device (they called it DBIS) was the key to success. And it might have been, if they could have maintained development efforts. The visionary Kip M Siegal died during a speech to the congressional budget committee in the late 1970s, and KMS badly needed capital to succeed. (They got a non-technical capitalist looking for his “homerun” and the grudging support from the AEC/DOE. KMS fusion was terminated when Federal support for fusion research was strangled.) Oops. DBIS might have been the key to success with laser direct-drive, since it was and is the only way I am aware of that offered uniform illumination over a spherical surface,using only a single driver beam. If they could have sustained its development. Sometimes, optimism can get in the way of success. At least eight groups are actively trying for funding. A few have tried TED talks and other ways to do crowd-sourcing, nice for support below US$ 1 M, but this is a scratch of the topsoil when we need to dig deep for the mother-lode payoff of a device that wins over the (unknown) obstacles that lie in the path to success. Should anyone think that a fusion power production machine should be cheaper than a space mission? Or a deep-sea submarine? Or a functional antiballistic missile system? KMS found that asymmetries in target, illumination and timing kept the now-small laser from generating fusion power. NIF is currently discovering the reality of instabilities and illumination symmetries. My boss in magnetic fusion commented 30 years ago that he knew the honeymoon was over when he saw all the publications on “mode-structure” in a tokamak discharge. Things do not work as naive dreams would have them. That is the time when tough-minded scientists roll up their sleeves, stop wasting time sleeping or eating and see the job to completion. So let’s get real, here. We need support way above the one million dollar mark. Some of the companies have already involved with venture capital sponsors, and I wish them well. In my experience most VC groups I have dealt with want a high payback, typically in 5 years, or they will chop the enterprise into pieces and sell each chunk off to get the immediate compensation. IMHO – This is not the path to joy. The contestants use one of 3 fuel types, which must affect how we judge them. 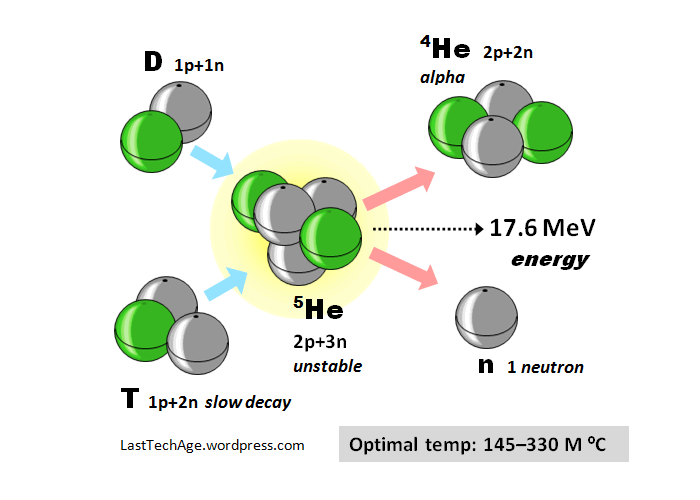 D-T deuterium fuses with tritium to make an alpha and a neutron. The Lawson criterion nτ double product gives maximum temperature before mutual speed is too high (fusion sticking probability and power production drop) as 330 M degrees (28.3 keV). D-T has the lowest temperature range for efficient, ignited power production. The test-bed tokamaks around the world achieve the triple product temperature. D-3He deuterium fuses with an isotope of helium and to make an alpha and a proton. Lower probability secondary reaction generate some neutrons. The Lawson criterion nτT triple product gives the minimum temperature to expect ignition as 545 M degrees C (47.0 keV). The Lawson criterion nτ double product gives maximum temperature before mutual speed is too high (fusion sticking probability and power production drop) as 1,290 M degrees C (111.0 keV). D-3He generates about 26 times fewer neutrons than DT. 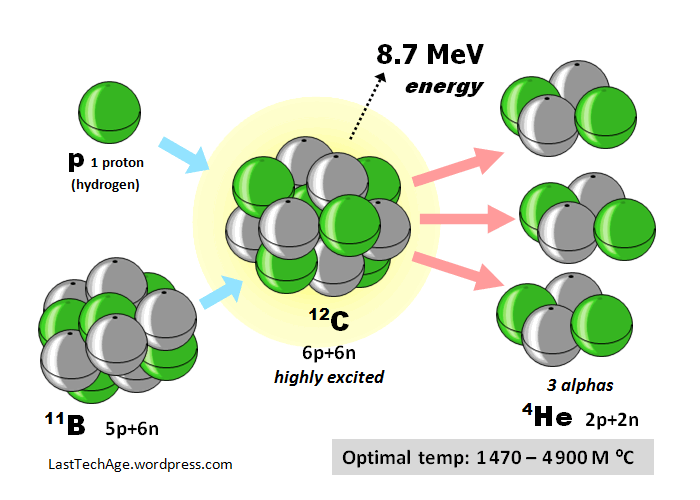 Reactors could be expected to survive long times without neutron related consequences, but the high required plasma temperatures are an issue for believability in its use, many think that this may be a long way in the future, after D-T fusion has been established. The biggest problem is the source of the helium 3. It was found on in Moon rocks in the late 1980s (it is deposted in the crust by the high energy solar wind) and the University of Wisconson’s Gerald Kulcinski has led a return-to-the-moon push to mine 3He for use for safe fusion reactors. Here is an interview with Dr. Kulcinski. 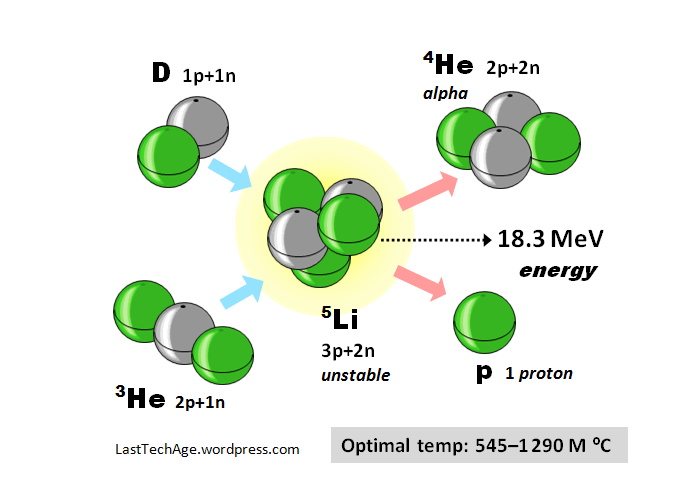 p-11B a proton fuses with an isotope of boron to make 3 alphas, no neutrons or protons. Secondary reactions do generate a small neutron background. The Lawson criterion nτT triple product gives the minimum temperature to expect ignition as 1,470 M degrees C (126½ keV). The Lawson criterion nτ double product gives maximum temperature before mutual speed is too high (fusion sticking probability and power production drop) as 4,900 M degrees C (422 keV). p-11B with fewest neutrons, is the safest fusion fuel. But the multiple (U.S.) billion degree demand is beyond most physicists’ expectation. This has been evaluated for at least 40 years with non-positive recommendations, for example, in 1998 Lampe and Manheimer published NRL/MR/6709-98-8503. Both from the extreme temperatures and the bad analysis results, one should be very careful in madly pursuing this fuel type. These diagrams and numbers are results of my own calculations. Both rely on accurate calculation of <σ·v> (the fusion cross section times relative velocity averaged over the statistical ensemble of states) since the nτ in the Lawson criteria is inversely proportional to use this. To get the peak energies for the reactions, I used the 4 parameter fitting coefficients for <σ·v> here. A 6 parameter fit from the University of Wisconsin here. All 8 of our contestants use paths that should have and would have been supported if our government had paid attention to its own “American Fusion Engineering Act of 1980.” The companies we will be examining have low temperature results that look promising, but there is a very long way between positive indicators and fusion energy power on the grid. Stay tuned for reviews of the players. 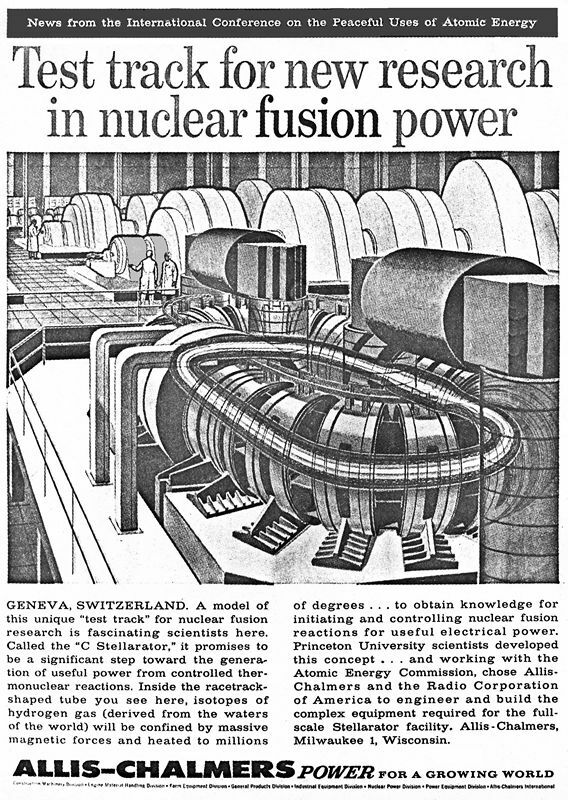 This entry was posted in Technology and tagged 1958 Fusion Reactor Ad, D-He3, D-T, Dynomak, EMC2, General Fusion, Helion Energy, KMS fusion, Lockheed CFR, LPP plasma focus, Naive fusion, p-B11, Tri Alpha Energy. Bookmark the permalink. 3He should be 2p+1n, 5He is 2p+3n. I am really grateful to Davor for pointing out this true howler. All fixed in the text, now. LastTechAge has published 2 true boners, due mostly to edit and re-edit process that go into making a blog post, but also to just plain carelessness. This time, I plead pressure to produce this series of posts for the error that is so blatant that it should have stood as though spotlighted. The first really bad error was referring to the NIF laser as being “frequency quadrupled!” I certainly knew better, was a physicist in laser fusion and actually headed up the physics effort at KMS Fusion at its end. Ouch. Yes, the reality for blue light fusion lasers is *frequency tripled*. But. Once (30 years ago) we had a functioning national test lab for KrF UV lasers with the Aurora Laser at LANL. LLNL stuck it to their old political enemy, had that thing defunded, though official history is “a bit” different. Current: our Naval Research Laboratory runs its Nike laser, a low power KrF version that looks really similar to Aurora. But with American-standard low priority funding. Our only priority funding sites for ICF are NIF at LLNL and Omega at Rochester University. The current should-have-been He3 but wrongly-written He5 is our second bone-headed edit job. My apologies to all. And, my deepest and truest thanks to the readers pointed them out.